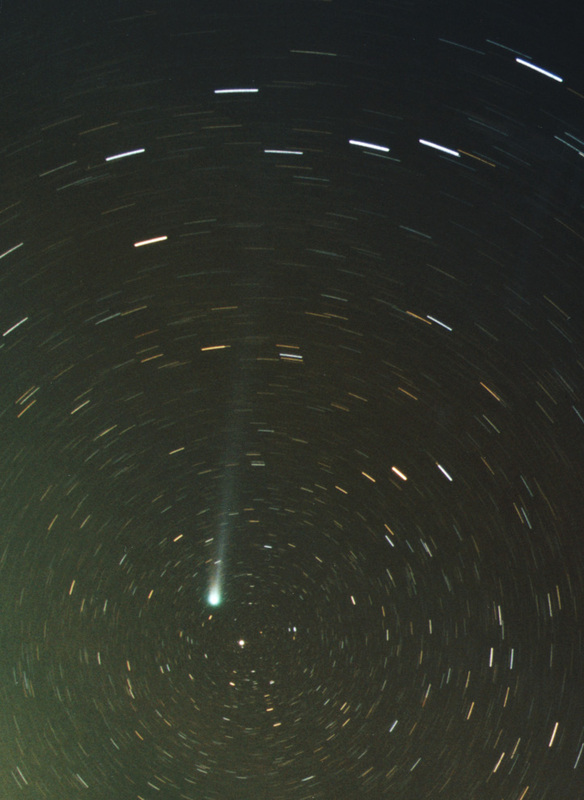 This wide-field view of comet Hyakutake passage near the Alpha UMi was taken on 1996 Mar. 27 (1h03-1h25UT) with the 3.5/65mm lens and T-Max 400 film (6x6 format). The field size is ~40x35 deg. The tail length is about 30 deg. The constellation of Ursa Major is visible on the upper part of picture. 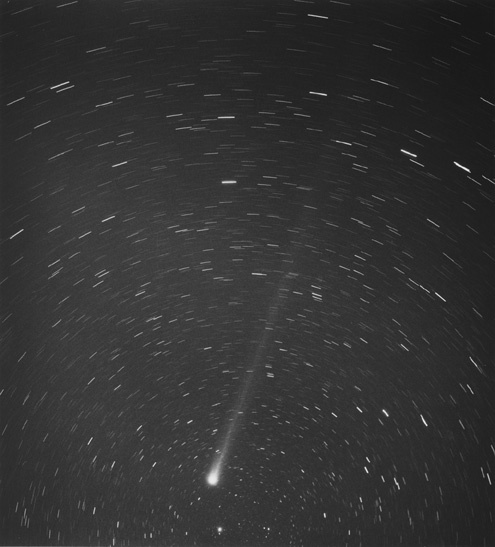 See the historical views of comet Hyakutake, passing near the Polaris in early morning of Mar. 27th. These images were taken by Herman Mikuz and Bojan Kambic from a dark site at Slovenske Gorice, 170km east of Slovene capital Ljubljana. On otherwise cloudy Central Europe, the weather satellite shows a small gap approaching to NE Slovenia. We traveled to this distant site and indeed enjoyed a 3-hr clear period. We were both impressed due to the splendid Hyakutake display. 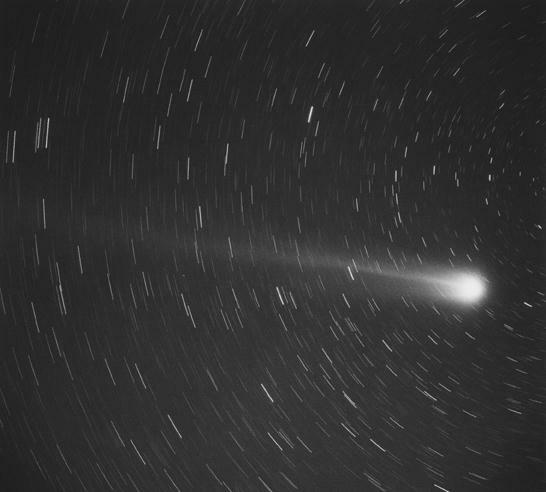 With the naked eye the tail spanned for 45 deg, up to Beta CVn and the estimated comet m1 was 0.4 magnitude. All images were guided on comet nuclear condensation. 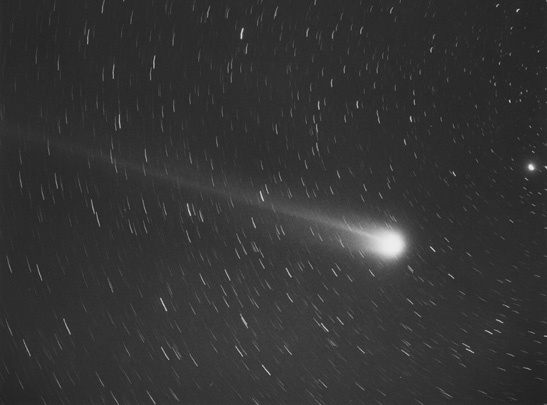 Wide-field image of comet taken on 1996 Mar. 27 (2h01-2h22UT) with the 3.5/250mm lens and T-Max 400 film (6x6 format). The field size is ~12x10 deg. Wide-field image of comet Hyakutake taken on 1996 Mar. 27 (2h57-3h15UT) with the 3.5/250mm lens and T-Max 400 film (6x6 format). The field size is ~12x10 deg. Polaris is the brightest star on the picture. Wide-field image of comet Hyakutake taken on 1996 Mar. 27 (2h01-2h31UT) with the 3.5/20mm lens and Fujicolor G-400 color negative film. 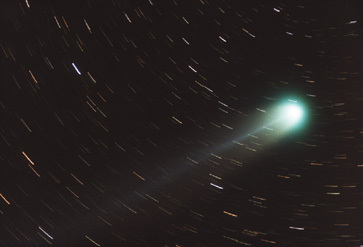 True-color image of comet Hyakutake taken on 1996 Mar. 27 (0h33-0h53UT) with the 3.5/250mm lens and Fujicolor G-400 color negative film. The field size is ~8x5.5 deg. 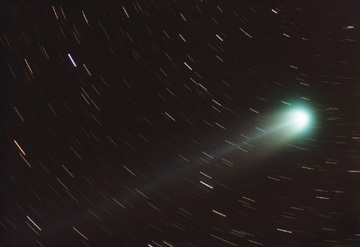 True-color image of comet Hyakutake taken on 1996 Mar. 27 (1h03-1h25UT) with the 3.5/250mm lens and Fujicolor G-400 color negative film. The field size is ~8x5.5 deg.